My version of the shopska salad! 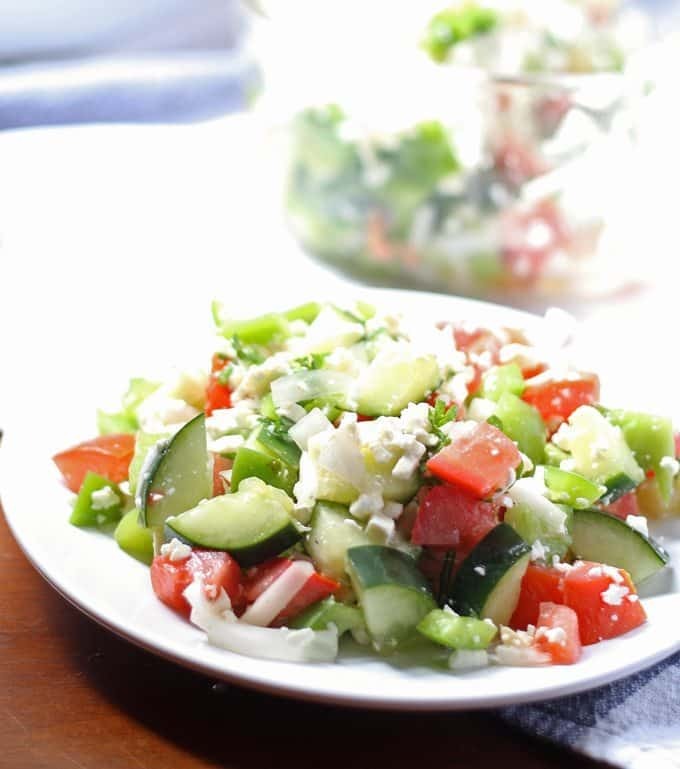 Cucumbers, green peppers and tomatoes with a healthy portion of feta cheese! Two weeks ago my friend Emma and I went out to lunch. I love my weird schedule because it means I have the opportunity to still hang out with restaurant friends (who work a lot of nights and weekends). She chose a Bulgarian restaurant a few blocks away from the restaurant I used to work at – and it was delicious. This is not a restaurant review, though if you are in the Chicagoland-area and looking for a Bulgarian restaurant, send me an email and I will give you the details. This is my take on a delicious salad that I ate. Anyway, I am not familiar with most Bulgarian food. The only particularly Bulgarian dish I have had before is cevapi (sze-va-pee I believe is how you pronounce it.) There is a vendor that sells this delicious ground meat sausage at street fairs in Chicago throughout the year – theirs is amazing and they serve it with a red pepper and eggplant sauce that I need to figure out how to make. When I saw cevapi on the menu at the restaurant, I knew I had to have it. Then I let Emma decide the rest. To her, having had shopska before, ordering the Bulgarian salad was a no-brainer. I didn’t really care either way because all I could think about was cevapi sausage. And then I took a bite of my salad. 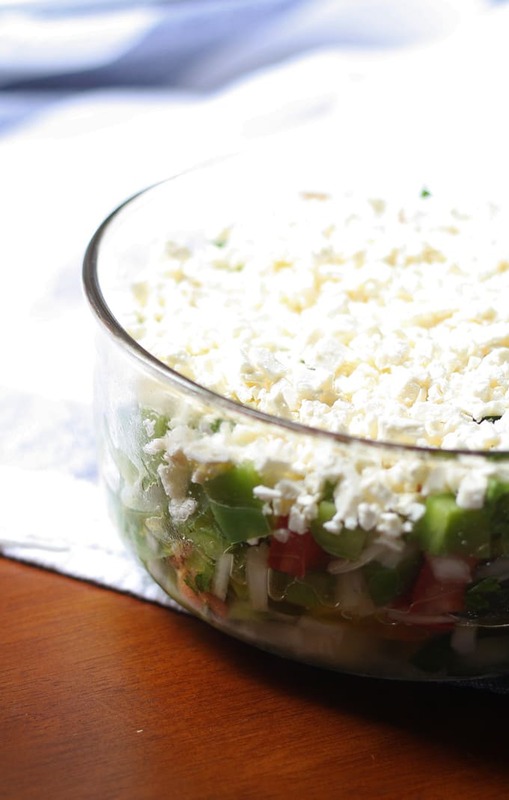 They served it in a big bowl with a generous portion of Bulgarian feta cheese across the top. I dove in and barely touched my cevapi when it came. I brought a little home for Mr B. and then set out to make it myself. 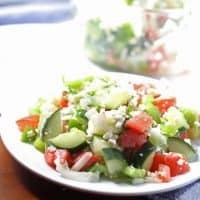 I had a very hard time finding Bulgarian feta cheese so instead I used Greek feta. It still works but if you can find Bulgarian feta I suggest you use that instead. Also, I didn’t add any olives because I couldn’t remember what type of olive was served at the restaurant. There weren’t many in it (the only reason I knew it was an ingredient was the single olive served in the center of the salad above the feta) and the salad still tasted the same without it. If you know what kind of olive I should use please let me know. Also, if I added olives and used Greek feta, I was concerned this would start to look like a Greek salad, which it is not. Dice the tomatoes, cucumbers and green peppers so they are about the same size. Neither of them are supposed to stand out more than the other and keeping the sizes uniform helps in my opinion. 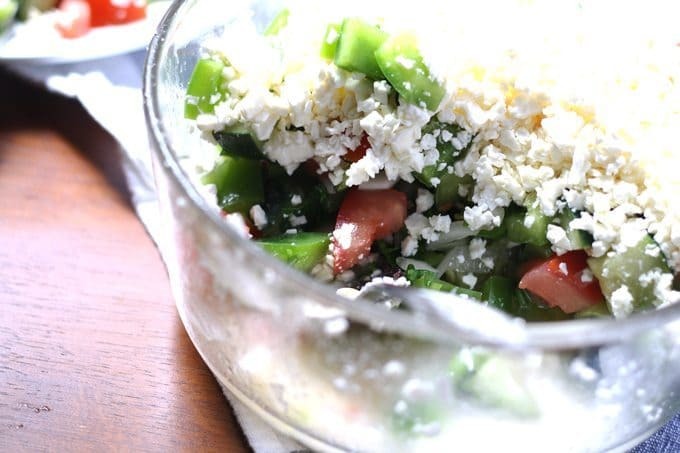 Combine all ingredients except the feta in a large bowl. 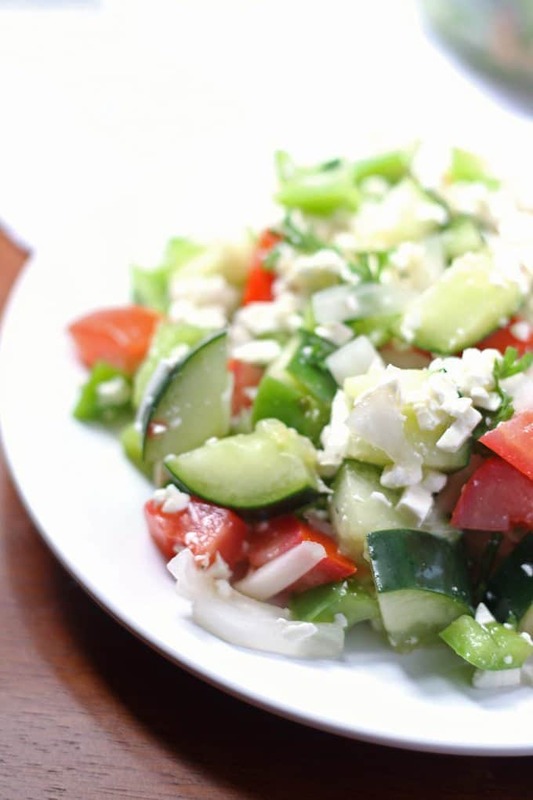 Sprinkle the feta cheese over the top of the salad so that it is completely covered with cheese. Cover and chill one hour before serving. The eggplant and pepper dip is called ajvar….easily found recipes online. Thank you Bill! It’s now on my to-make list! That looks so really refreshing! Yum! This looks delicious! I’m always looking for new easy salad recipes so I am definitely going to try this out. It looks way easy to make and to fresh! Love everything but the feta cheese. Not that big of a fan. I have never had Bulgarian food! Anel, I don’t think it would be the same without the feta unfortunately. Hello there! Shopska is my most favorite thing and I ate it every day and sometimes even twice a day while I was in Macedonia and Bulgaria! Olives Remt always used but when they are, I’m thinking they are kalamata or something very similar. I’ll be making shopska today as I’m missing it soooo much! Wish I could find the cheese here though. Our feta just isn’t as good :(.